In a recent post by the usually sound Aaron Churchill, the Fordham Institute researcher takes some significant pot shots at William Phillis -- the legendary Ohio public school advocate whose work led to the Ohio Supreme Court ruling four different times that the way the state funds public schools is unconstitutional. I played on Churchill's title for my title of this post. Churchill's major problem with Phillis' analysis of charter school expenditures is Churchill doesn't like the inconvenient truth that the average charter school spends several hundred dollars more per pupil than the average school district. Unfair! cries Churchill. You have to weight the average per pupil expenditure. That way it's more fair. He points to the calculation he made in his recent report arguing that more money needs to be given to charter schools as the only fair way to possibly calculate what charter schools spend. His "weighted" average per pupil expenditure is not an accurate reflection of how many tax dollars go to charters. If you multiply his "weighted" average by the number of students in charters, the amount isn't actually what charters spend. If you multiply the "unweighted" amount, it does. All weighting does is make it look like charters spend less than districts. At the end of the day, taxpayers want to know how much of their money is being spent. And in charter schools, about $400 more is being spent per pupil. In addition, Churchill ignores the fact that charters, on average, spend about $1,200 more per pupil on administrative, non-instructional costs than school districts. Even big urban districts spend $300 less per student. So, in other words, if Ohio charter schools reduced their administrative spending to that of Ohio school districts, even on Churchill's "weighted" calculation, they would end up spending about the same as districts. It's funny how free market reformers like Churchill quickly disparage "bloated" school district administration, but never point out that if charters were simply more efficient at spending money in the classroom, they wouldn't be begging for more. That's because overall, charters spend about twice the percentage of their money on administrators as school districts do, equating to about 1 in 4 dollars spent by charters. Next, Churchill goes to the old argument that charter students have far more challenging populations than school districts. Which is generally true, on average. However, Churchill always wants to compare charters with the state's 8 major urban school districts (Akron, Canton, Cincinnati. Cleveland, Columbus, Dayton, Toledo and Youngstown). If one does that, about 2 out of every 3 charter schools have 100 percent economically disadvantaged. Meanwhile, only 2 major Ohio urban districts have less than 100 percent economically disadvantaged populations. On average, Ohio's urban districts have about 5 percent higher rate of minority students and about a 10 percent higher rate of economically disadvantaged students than Ohio charter schools. So, using Churchill's argument that schools with more challenged populations should get more money, it seems that the fact urban districts spend more per equivalent pupil than charters makes sense. Also absent from Churchill's analysis is the fact that every dollar leaving Akron and Cincinnati for a charter school last school year went to a charter that performed worse on more state report card measures than Akron and Cincinnati. Churchill also failed to mention that while lots of folks are rightly concerned that 14 Ohio school districts received overall grades of F on the state report card last year, marking them for state takeover, if one applied that standard to Ohio charter schools, 103 of 340 charters receiving grades either received Fs or "Does Not Meet Standards" if they're a dropout recovery school (mind you that "standard" is graduating about 7 out of 100 kids in 4 years). So 3 out of 10 Ohio charter schools would be set for state takeovers, if the state takeover law applied to them the way it does school districts. Oh, and about $200 million of your tax dollars went to charters that would have been marked for state takeover, if they were treated like districts. I anticipate Churchill will complain that I'm comparing all charters with all Ohio school districts. Charter proponents demand their performance only be compared with school districts and buildings that struggle the most. However, every school district but one had at least some state money transferred to charters from their state funding. You don't get to take money from every school district, yet demand you be held accountable relative to the performance of the most struggling districts. Especially when the current system forces local property taxpayers in those districts to fork over more of their property taxes to make up for the state funding transferred to charters. And here is the breakdown of charter and district letter grades on the state report card this last year. 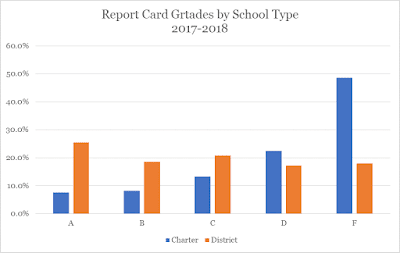 As you can see, about half of all charter grades are F -- almost more Fs than all other grades combined -- and more than 7 out of 10 are D or F. Meanwhile, about 6 in 10 district grades were A, B, or C.
I guess what I'm most disappointed by though is Churchill's utter lack of deference and respect for Phillis, who more than any single person in the history of the state has held politicians' feet to the fire on equal and adequate funding for all students. Frankly, Phillis has forgotten more education funding and policy than either I or Churchill will ever know. Churchill's cheap, ad hominem attacks on this man who has spent his life fighting for all kids to receive a world-class education is truly distressing. My advice to Mr. Churchill would be to stick with trying to knock me around. Because with Phillis he is punching way above his weight class. Bravo Mr. Dyer. In many other businesses many charters would be bankrupted and closed and their leadership put up for criminal charges for their use of funding. Charters will not be successful until they defund and discredit public education to the point where the middle class finally believes they are a viable alternative. The whole process reeks of a long drawn out corporate take over. The charterites are using the takeover targets resources to create their own alternative system and weaken their target. One thing they did not count on is that most people like their public schools. Now they want to up the ante with Huffmans's vouchers for all plan. Stay tuned for further shenanigans. I agree that charters will not be successful, but they will not go away either because they are a political cash-cow for the Rs. Thank you for this takedown of the ridiculous claims of a charter lover who also could not resist a personal putdown of William Phillis. The Fordham is determined to extract more money for charters in Ohio, never mind the consequences or lack of integrity among its spokespersons, in this case, Aaron Churchill.